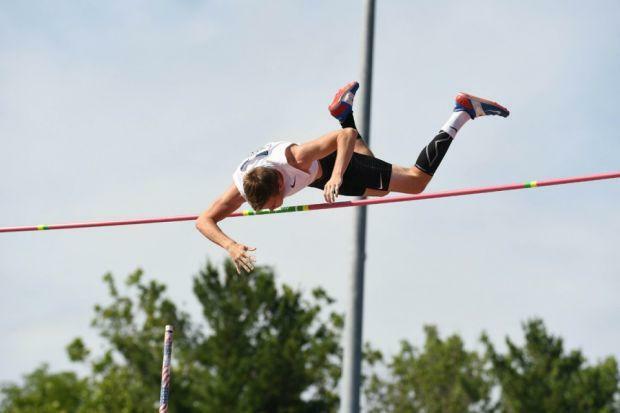 The greatest high school pole vaulter in Illinois history may have felt like he's been in a game of baseball with us during the outdoor season. The Bloomington HS graduate Zach Bradford was often viewed as living the dream from a fan's perspective. Just like a professional baseball relief pitcher taking a day off or waiting to come in the 9th inning to close out the game, Bradford often spent track meets chilling and waiting his turn to shine. His latest adventure inside of the steamy Robert C. Haugh Track and Field Complex on the campus of Indiana University was a long one. Although the field was small in comparison to what he is used to with 10 competitors, the approach was the same. Five of the vaulters passed on the opening height of 15-11. Bradford started at 16-10.75 and cleared it with ease. Among the chief competitors were KC Lightfoot and Cole Riddle. Lightfoot of Lee's Summit, MO had been on a roll as the US#2 performer at 18-5. His string of 18-foot efforts coming in could have been a cause of concern for the mentally weak. Riddle presented a whammy and a roadblock to next month's U20 championship in Finland. He came off a solid freshman year competing for Arizona State University. Riddle, Lightfoot, and Bradford virtually proceeded to each successive height with little resistance. Riddle had zero misses at 18-0.5, matching Bradford and earning a new personal best. Lightfoot had one miss from his opening height 16-4.75 and then skipped along to 18-2.5 where Bradford made the height on his first attempt. In the process, the future University of Kansas performer was sitting in the catbird seat. Riddle fouled out on his three attempts leaving Lightfoot the stress of making the height or finishing third. He did not make it and Bradford earned his first junior crown. Already the best that Illinois has witnessed with a pole in his hand, Bradford and meet officials took a moment to determine the next height which was on the performance chart. The bar was raised to 18-4.5 where Bradford appeared to have trouble negotiating the barrier. It didn't matter because is the champion and needed to go and get certified and processed for Finland. Among the goodies was drug testing, getting a passport in order, and interviews which took more than three hours today. But it was all worth it. Plainfield North sophomore star Marcellus Moore returned to competition after a two-week break. The much-needed hiatus proved well as he advanced to the 100m final with a time of 10.68. As one of the youngest entrants in the lion's den that contained the top high schooler Anthony Schwartz of Florida and a slew of seasoned collegians, Moore did not back down. He would go on to place sixth overall and keep his name in the relay pool for Finland. This experience is exactly what Moore wanted instead of taking the New Balance Nationals Outdoor route where he would have certainly earned All-American status.